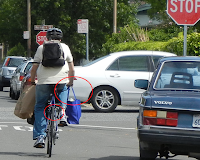 There is is a lot of information and debate about bicycle safety these days. Most of it, except for the helmet debate, is focused on protecting bicycles from external risks: cars. All good stuff to talk about. I've profiled my friend Johan's ordeal after he put his knee through a car that pulled in front of him. Nevertheless, the recent experience of another friend of mine reminded me to stay focused on the internal risks as well. Her experience, in particular, may become more common as all of us start using our bikes for more than sport. She did something a lot of us have done at one time or another. It looks harmless enough when you see it but it is a potentially harmful way to travel on a bike. First, let's highlight the risk. 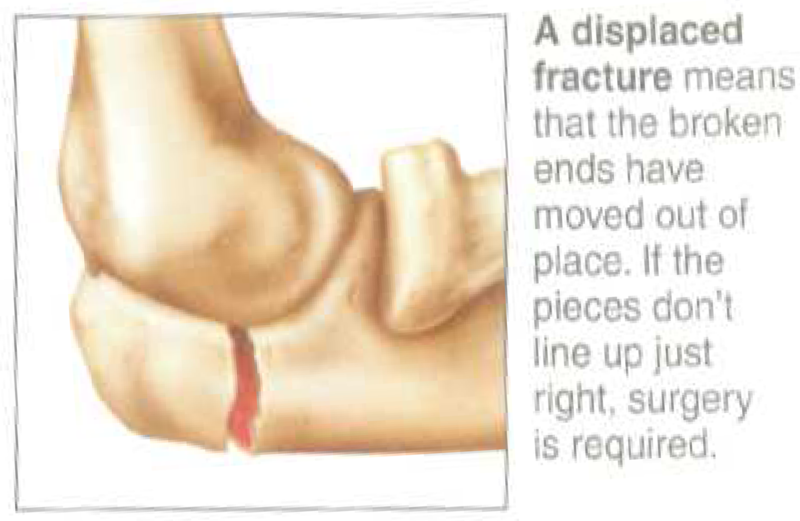 On this page, is an x-ray of her broken elbow from the accident: a displaced fracture. 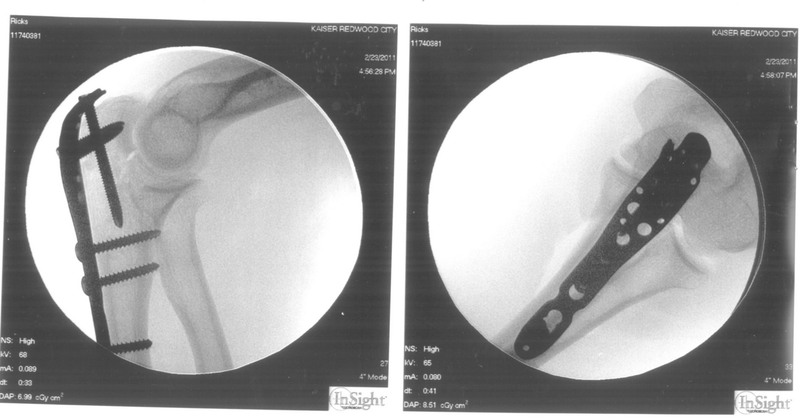 It shows the metal plate and screws holding her arm together. When she first did this, she said the pain was so bad it took over her entire consciousness for several minutes. She lay in shock right outside her office next to her bike. No one was around to help. When numbness finally kicked in, she was able to get up and then some co-workers finally found her and helped. She had just left her office and had only been riding for a few seconds. No other vehicles or people were involved. The thing that caused all this was her purse. She had hung it on her handlebars for a second. It somehow got caught between the front wheel and the fork and locked up the wheel. That threw her over the handlebars and plunged her elbow squarely into the pavement. It's been 8 weeks since the accident. The surgery went well. The cast is off. She still has a metal band threaded under her skin that must be taken out in a few weeks. But, otherwise, she is fine. To her credit, she hasn't been the least bit shell-shocked by the incident. She is already riding again. Insanely, she started riding within a week of the accident. This is so not recommended since another crash could damage the repaired elbow. However, it demonstrates this stuff doesn't have to deter you from bicycle commuting. The one change she has made to her cycling is the installation of a rack and basket on the *back* of her bike. I've been urging her to install an enclosed pack on the back because things can fall through the wired basket and catch on the wheel. Until then, even if that happens, on the back wheel it should not launch her so badly. 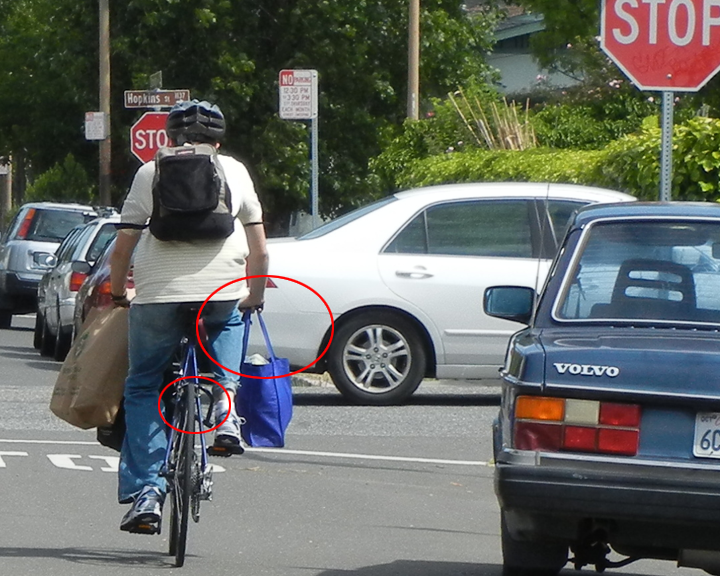 Today, I saw a guy pedaling home from the grocery store with 3 bags swinging from his handlebars. He also had a U-Lock dangling over his back wheel. I tried to warn him about the danger but he didn't believe me. That inspired this post. Hopefully, this will help some folks avoid a lot of pain and hassle. We hear about dramatic bike crashes and fatalities all the time but the mundane stuff is no less dangerous so it seems like a good cautionary tale to feature. Since I'm the one who introduced her to cycling I feel responsible that I didn't warn her about this so I'm venting that guilt by way of this caution to others. While pushing for greater safety in our bicycle infrastructure, we've got to stay focused on the safety within. Sometimes, it's the little stuff that gets you. I've heard similar stories about headphone wires falling out and snagging. If it swings or dangles it can snag. Watch out. Checking the break is what I do first. I remove every lock if I am ready to go and I always remember it because of the accident that I went through. Luckily, my emergency locksmith friend was with me when it happened. This empowered the following posting. With any luck, see here this tends to enable some people keep away from loads of suffering plus problem.